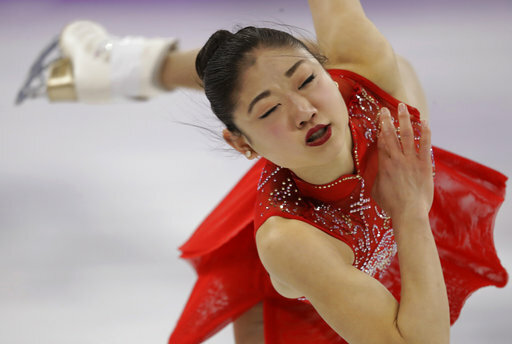 Mirai Nagasu smiled ear-to-ear midway through her disappointing free skate at the Pyeongchang Olympics on Friday, a rarity for the American figure skater whose laser-like focus during competition has become legendary. Turns out she was finally enjoying herself. During a candid and often comical interview following her performance, the 24-year-old Nagasu let down her guard with tongue-in-cheek comments about “saving” the U.S. in the team event, auditioning for “Dancing With the Stars” during her free skate and how the size of Team USA’s contingent in the athletes’ village means she hasn’t had any hot water for showers. More than anything else, Nagasu said, she was simply whipped. The grind of competing for an Olympic spot at last month’s national championships fed straight into preparations for Pyeongchang, and stepping onto the ice the opening weekend to help the Americans win bronze in the team event. They were in good shape before Nagasu’s performance, but she indeed put an exclamation mark on it by becoming the first American woman to land the difficult triple axel in Olympic competition. Saved her team? That may be a little embellishment. Nagasu tried the triple axel again during the women’s short program but fell, and that essentially scuttled any chance she had at an individual medal. She was going to attempt it again in the free skate, but she hit a rut in the ice Friday and had to abort the attempt. She wound up finishing 10th, sandwiched between teammates Bradie Tennell and Karen Chen. Nagasu finished fourth at the 2010 Vancouver Games, when many thought she would carry on the legacy of great American figure skaters. But she was controversially left off the team for Sochi in favor of the more accomplished Ashley Wagner, and that spurred her to keep going for another Olympics cycle. It’s a near-certainty she won’t be around another four years, so perhaps it made sense that she was putting her personality _ and her charisma _ on display for a certain ABC television show. One where fellow skaters such as Evan Lysacek and Kristi Yamaguchi have had success. “I would like to be on ‘Dancing With the Stars’ because I am a star,” Nagasu said with a another big smile. “I made history here by landing the first triple axel for a U.S. lady at the Olympics so I think that is a big deal. I hope I get more opportunities to let my personality just shine.